سیستم fMRIدر شناخت فعّالیت‌های عصبی کاربرد زیادی دارد. پاسخ مغز به آزمایش ترتیب داده شده از طریق سیگنال‌ها و تصاویر به دست آمده در خلال تصویربرداری fMRI، قابل بررسی است. مطالعات مختلف انجام شده بر روی سیگنال میزان اکسیژن دهی خون، رابطه غیرخطی بین تحریک اعمالی و پاسخ دریافت شده از نرون‌ها را نشان می‌دهد. در این مقاله، به بررسی روش‌های غیرخطی تحلیل تصاویر fMRIخواهیم پرداخت. برای این مقصود، به بررسی روش‌های غیرخطی با تأکید بر پارامترهای فیزیولوژیکی اثرگذار بر سیگنال BOLDو روش‌های غیرخطی که بدون در نظر گرفتن عوامل فیزیولوژیکی، رابطه ورودی و خروجی، یعنی سیگنال تحریک و سیگنال fMRIرا مدل می‌کنند؛ می‌پردازیم. روش بالون را نیز به عنوان یک روش غیرخطی فیزیولوژیکی بررسی کرده و از طریق آن روش جدیدی برای تعیین مناطق فعّال مغز ارائه کرده‌ایم. همچنین روش‌های همرشتاین-وینر و NARMAو مدل ولترا به عنوان روش‌های غیرفیزیولوژیکی مورد بحث قرار گرفته و توانایی آنها در مدل کردن و تشخیص مناطق فعّال مغز مورد ارزیابی قرار گرفته است. علاوه بر روش‌های به‌کار رفته برای آشکارسازی نقاط فعّال بر روی دو مجموعه از داده‌ها (با تحریک شبیه‌سازی شده و تحریک واقعی) ارزیابی شده‌اند. در مجموعه دادگان شماره یک به ازای سطح آستانه 45/0 در هر سه مدل، میزان اندیس جکارد برای مدل‌های همرشتاین-وینر، NARMAو مدل ولترا به ترتیب 90/0، 0/1 و 91/0 به‌دست آمد. 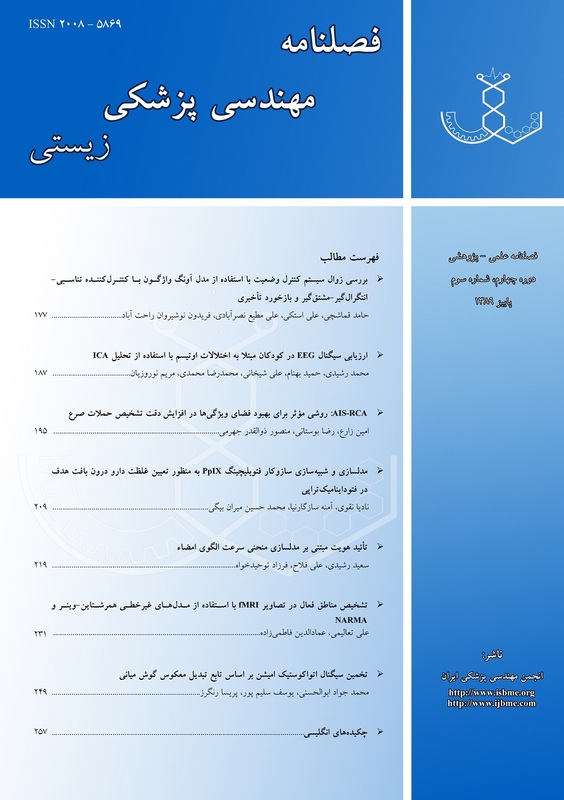 در مجموعه داد‌گان شماره دو به ازای آستانه‌های مختلف (به ترتیب 35/0، 40/0 و 45/0) این اندیس به ترتیب 85/0، 9/0 و 87/0 است. Functional magnetic resonance imaging (fMRI) is widely used for investigation of brain neural activity. This imaging technique obtains signals and images from human brain’s response to prescheduled tasks. Several studies on blood oxygenation level-dependent (BOLD) signal responses demonstrate nonlinear behavior in response to a stimulus. In this paper we investigate nonlinear modeling of BOLD signal activity to model the nonlinear and time variant behaviors of this physiological system. For this purpose two categories of nonlinear methods are considered, first those one with emphasis on physiological parameters which affect BOLD response and methods model the input and output of system without any refer to all the hidden state variables (physiological parameters. Balloon model is analzyed and a new approach for activation detection based on this model is introduced. In addition, the Hammerstein-Wiener, NARMA and Volterra kernels are investigated as nonlinear and nonphysiological methods and their ability in detection of activation detection are compared. The Activation detection methods have been applied on the two data sets (real and synthetic). For synthetic data and threshold equal to 0.45, the Jaccard index for Wiener- Hammerstein, NARMA, and Volterra model was 0.9, 1.0, and 0.91, respectively. In real dataset and for optimal threshold (0.35, 0.4, and 0.45) the same index was 0.85, 0.90, and 0.87, respectively. Ogawa S., Menon R.S., Tank D.W., Kim S.G., Merkle H., Ellermann J.M., Functional brain mapping by blood oxygenation level-dependent contrast magnetic resonance imaging- A comparison of signal characteristics with a biophysical model, Biophys, 1993; 64(3): 803-812. Friston K. J., Jezzard P., Turner R., Analysis of functional MRI time series, Human Brain Mapping, 1994; 1(2):153-171. Vazquez A. L., Noll D. C., Nonlinear aspects of the BOLD response in functional MRI, NeuroImage, 1998; 7(2): 108-118. Logothetis N. K., The underpinnings of the BOLD functional magnetic resonance imaging signal, NeuroScience 2003; 23(10):3963-3971. Buxton R. B., Wong E. C., Frank L. R., Dynamic of blood flow and oxygenation changes during brain activation: The Balloon Model, Magnetic Resonance in Medicine, 1998; 39(6): 855-864. Harrison L., Penny W. D., Friston K. J., Multivariate autoregressive modeling of fMRI time series, NeuroImage, 2003; 19(4):1477-1491. Kamba M., Sung Y., Ogawa S., A dynamic system model-based technique for functional MRI data analysis, NeuroImage, 2004; 22(1): 179-187. Tong H., Non-Linear Time Series: A Dynamical System Approach, Oxford University Press, 1990. Schetzen M., The Volterra and Wiener Theories of Nonlinear Systems, John Wiley & Sons, 1980. Chance J. E., Worden K., Tomlinson G. R., Frequency domain analysis of NARX neural networks, Journal of Sound and Vibration, 1998; 213(5):915-941. Yokoyama M., Watanabe A., Estimation errors of volterra kernels measured by use of nonwhite input, Electronics and Communications in Japan, 1992; 75(1):53-63. Friston K. J., Mechelli A., Turner R., Price C. J., Nonlinear Response in fMRI: The Balloon Model, Volterra Kernels, and Other Hemodynamics, Neuroimage, 2000; 12(4): 466-477. Mercer K. J., Identification of Distortion Models, Ph.D. Dissertation, 1993. Billings S. A., An overview of nonlinear systems identification, Proc. IFAC Syrup Ident System Param Est, 1985: 725-729. Segal B. N., Outerbridge J. N., Vestibular (semicircular canal) primary neurons in bullfrog: nonlinearity of individual and population response to rotation, Neurophys, 1982; 47(4): 545-562. Hunter I. W., Frog muscle fiber dynamic stiffness determined using nonlinear system identification techniques, Biophys, 1985; 47(7): 247-287. Riera J., Bosch J., Yamashita O., Kawashima R., Sadato N., Okada T., Ozaki T., fMRI activation maps based on the NN-ARx model, NeuroImage; 2000; 23(2): 680-697. Levin A. U., Narendra, K. S., Control of nonlinear dynamical systems using neural networks: controllability and stabilization, IEEE Trans. Neural Networks, 1993; 4(2): 192-206. Haykin S., Neural Networks: A comprehensive foundation, 2nd ed. Prentice Hall, 1999. Scales L. E., Introduction to Non-Linear Optimization, New York, Springer-Verlag, 1985. Jacobsen D. J., Hemodynamic modelling of BOLD fMRI - A machine learning approach. PhD Dissertation, Technical University of Denmark, Denmark, 2006. Boxerman J.L., Bandettini P.A., Kwong K.K., Baker J.R., Davis T.L., Rosen B.R., Weisskoff R.M., The intravascular contribution to fMRI signal change: Monte Carlo modelling and diffusion-weighted studies in vivo, Magnetic Resonance in Medicine, 1995; 34 (1): 4-10. Riera J., Watanabe J., Kazuki I., Naoki M., Aubert E., Ozaki T., Kawashima R., A state-space model of the hemodynamic approach: nonlinear filtering of bold signals, Neuroimage, 2004; 21(2): 547-567. Buxton R. B., Frank L. R., A model for the coupling between cerebral blood flow and oxygen metabolismduring neural stimulation, Cereb. Blood Flow Metab., 1997; 17(1):64-72. Miller K.L., Luh W.M., Liu T.T., Martinez A., Obata T., Wong E.C., Frank L.R., Buxton R.B., Nonlinear temporal dynamics of the cerebral blood flow response, Human Brain Mapping, 2001; 13(1): 1-12. Friston K. J., Bayesian Estimation of Dynamical Systems: An Application to fMRI, NeuroImage, 2002; 16(2): 513-530. Chamber M. C., Full Brain Blood – Oxygen – Level –Dependent Signal Parameter Etimation Using Particle Filters, Master of Thesis, Virgiana, 2010. Deneux T., Faugeras O., Using nonlinear models in fMRI data analysis: model selection and activation detection, NeuroImage, 2006; 32(4): 1669–1689. Luo H., Puthusserypady S., Estimation of the Hemodynamic Response of fMRI Data Using RBF Neural Network, IEEE Trans. Bio. Med. Eng., 2007; 54(8): 1371-1381.